D a n c e s W i t h W o o l: New cardigan? The sun almost came out from behind the clouds today when we were doing our daily rounds. Almost but not quite, the temperature was hovering around zero and all in all we had very pleasant weather and a very good walk. I was in deep thoughts through the whole time and hardly noticed the time, as I was pondering what to knit next ... or rather how to approach my next big project. I am still knitting mittens and thinking about crocus/flower design ones but I would like to have something big on the needles that I could pick up when there is nothing else. I have knitted two twined sweaters, very simple ones knitting-wise but both of them have heavily embroidered cuffs. Both were epic projects and the first one lingered in the knitting basket at least for the duration of a whole year. When each one of them was done, I was quite tired of them and neither got lots of use right after the needles. This year I bought myself a new coat to use during my daily walks and this one is more or less just a shell and I need layers of wool under it depending on the weather. For years I have worn a down coat but since I am a firm believer of all things wool, I decided to buy a shell and decided to start using my wool sweaters, as I have many, and out of the closets came both of my twined ones. The first one is a short one - good for milder temperatures and the other a long one for colder days. Every time I wear either of them, I am always sort of surprised when my eyes happen to glance at the embroidery and every time it makes me very happy. I am happy that finally these twined sweaters are being used, after all I used lots of time when making them, and it would be a shame to hide them in the closets. They are both sweaters and now I would love to have a cardigan with a zipper. I have been knitting these stranded mittens lately (not twined knitting though) and now I am thinking of knitting the cardigan with the same technique. Plenty of work but oh! then plenty of surface to embroider on. 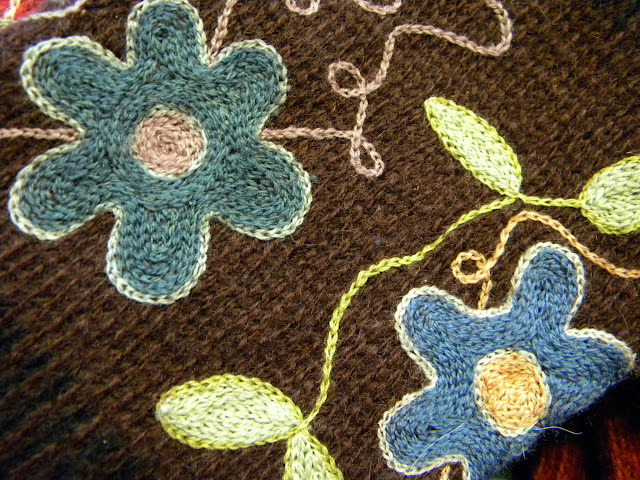 So far I have not decided on the yarn, nor the color, design or embroidery. All in good time. I have some sort of idea of the yarn... good wool in sheep colors. I will keep you posted and now will return to my mittens. Lene, your work is as stunning as ever, I love it. I always love to see a post on your blog! 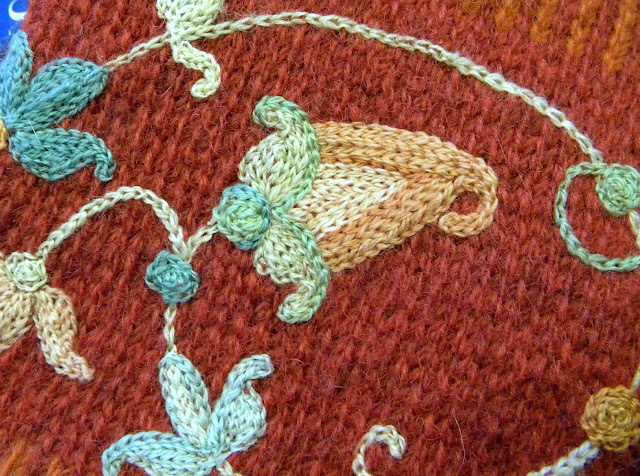 I really like the embroidery on your knits. It does make a person smile to see it. You're so talented! I'm a bit curious as to why you'll choose shetland wool rather than your native Kainuunharmas? I love these two sweaters. I remember when the red one was on this blog, and I have looked at both on Ravelry many, many times. You take knitting to a whole new level. I can't wait to copy --I mean see-- what you design. Beautiful. Can you recommend a book which would teach twined knitting? In english? Dear Lene, you make the world beautiful every time I see what you are up to! Thank you, thank you! Oh your sweaters are so beautiful . . . they should keep you nice and warm in all that lovely snow. The embroidery is very beautiful. 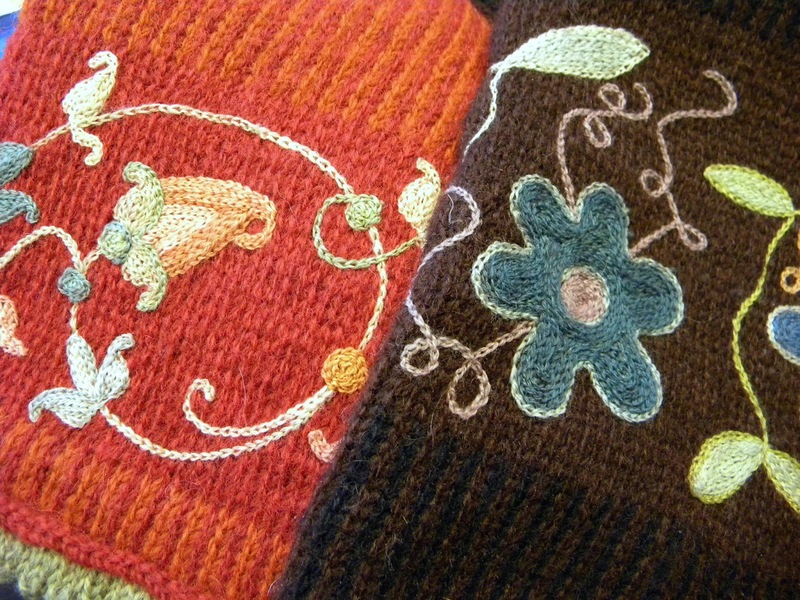 These sweater cuffs are absolutely gorgeous! You are a master. Your work is imply amazing! So beautiful. Thank you for sharing. Thanks so much for this post. It was so so interesting. I didn't know anything about this technique. Every time you mention that Symposium in Vaasa, I would like they could repeat than wonderful meeting. There is an excellent book called Twined knotting by Brigtta Dandanell and Ulla Danielsson published by Interweave in the late 8o's. There are sometimes 2nd hand copies but tend to be very expensive. I love your blog and the beautiful work you make Thank you. I meant Twined Knitting!! in my last comment!